Astronomers have captured an image of a pulsar flying through space at 20 times the speed of sound, with radiant twin tails of X-ray light stretching nearly two billion miles from this tiny, dense sphere only about 12 miles across. This first clear image of a pulsar's X-ray bow shock, from the European Space Agency's XMM-Newton observatory, is featured in a Science magazine cover story on September 5. The object, Geminga, in the constellation of Gemini, is the closest known pulsar to Earth, about 500 light years away. More than a pretty picture, the result provides unique insight into the contents and density of the interstellar "ocean" Geminga is plowing through, along with independent estimates of key pulsar properties: mass, radius, magnetic field strength, and speed at which such pulsars are "kicked" when born in star explosions. "We have this spectacular view because Geminga is travelling almost directly across our line of sight," said Dr. Patrizia Caraveo of the Instituto di Astrofisica Spaziale e Fisica Cosmica (IASF-CNR) in Milan, Italy, lead author on the Science report. "The tails appear to be the bright edges of a three-dimensional shock wave sculpted by Geminga, like the wake of a ship travelling across the ocean." A pulsar is a type of rapidly spinning neutron star that emits steady pulses of radiation with each rotation, funneled along strong magnetic field lines, much like a lighthouse beam sweeping across space. A neutron star is the core remains of an exploded star once at least eight times as massive as the Sun. Most pulsars emit radio waves. 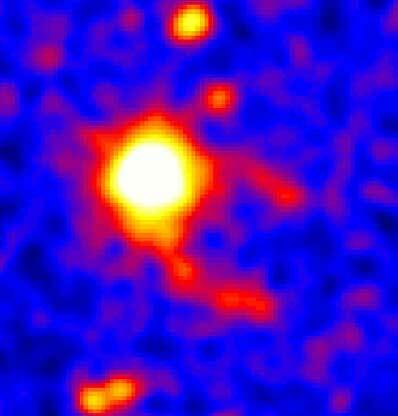 Yet Geminga is "radio quiet" -- a peculiar object discovered 30 years ago as a "gamma-ray only" source. (Geminga has since been detected in the X-ray and optical light wavebands.) Through processes not fully understood, Geminga is the second-brightest gamma-ray object in the sky. Geminga generates this highest-energy form of light by accelerating electrons and positrons, a type of antimatter, to high speeds as it spins like a dynamo four times per second. Astronomers had assumed that all the electrons would be converted into gamma rays emitted close to Geminga. The detection of dramatic X-ray tails show clearly that many electrons are escaping. Geminga can now serve as an interstellar probe, Caraveo said. The brightness and thickness of the X-ray tails are a measure of the density of matter in between stars, the vast regions darkness that remain largely unmeasured. The intensity and angle of the tails confirm earlier measurements of Geminga's proper motion, velocity, radius, and mass from optical observations. In addition, this observation of Geminga with an X-ray observatory may provide clues to the nature of unknown gamma-ray sources, according to Bignami. Of the 271 higher-energy gamma-ray objects detected by a NASA telescope called EGRET, 170 remained unidentified in other wavebands. These unidentified objects about be "gamma-ray pulsars" like Geminga, whose optical and X-ray light might only be visible because of its nearness to Earth. Only about a dozen other radio-quiet pulsars are known, and Geminga is the only one with tails. Bignami named Geminga for "Gemini gamma-ray source" in 1973. In his local Milan dialect, the name is a pun on "gh' e minga," which means "it is not there." Indeed, Geminga was unidentified in other wavelengths until 1993, twenty years after its discovery. Bignami is the director of the Centre d'Etude Spatiale des Rayonnements (CESR) in Toulouse, France. DeLuca, Mereghetti and Pellizzoni are researchers at the IASF-CNR. Mignani is with the European Southern Observatory in Garching, Germany. Tur is with CESR. And Becker is with the Max-Planck-Institut fuer extraterrestrische Physik in Garching.